There are lots of online tools for checking your ISP provided internet speed. Most are web based interfaces and there are some great ones out there. The most popular is probably www.speedtest.net, but we also have www.fast.com, www.speedof.me, … even Google let’s you do it directly from its search page (you have to search using US-based google.com, not any of Google’s other country TLDs). Remember 1 megabyte per second = 8 megabits per second, and the web interface returns results in megabits per second. If you don’t have python installed you can use the script below which is entirely written in bash. This could be useful for running on some internet-of-things devices which have telnet or SSH but don’t have python installed. Or to run on some routers (e.g. DD-WRT or Tomato) which you can SSH into but may not have python installed. This script will keep looping through different servers until you cancel it (Ctrl+C), at least I’ve never been patient enough to let it go long enough to finish on its own! 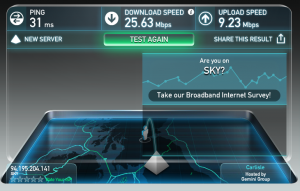 I’ve found that speedtest.sh tends to show much lower speeds than the other tools. :: 1 Kilobytes/sec (K/s) = 0.007813 megabits/sec (Mbps). :: To CONVERT, use negated rate as first argument to netspeed. Connecting to speedtest.fremont.linode.com (speedtest.fremont.linode.com)|50.116.14.9|:80... connected. All credit to this Hak5 youtube video. They go into a lot more detail on this stuff in the video. The gist above, *netspeed.sh*, has been deprecated. again made easily accessible by **Bash shell scripts** for all POSIX and Linux systems. Please visit https://git.io/speed to obtain the code. PR are welcomed!